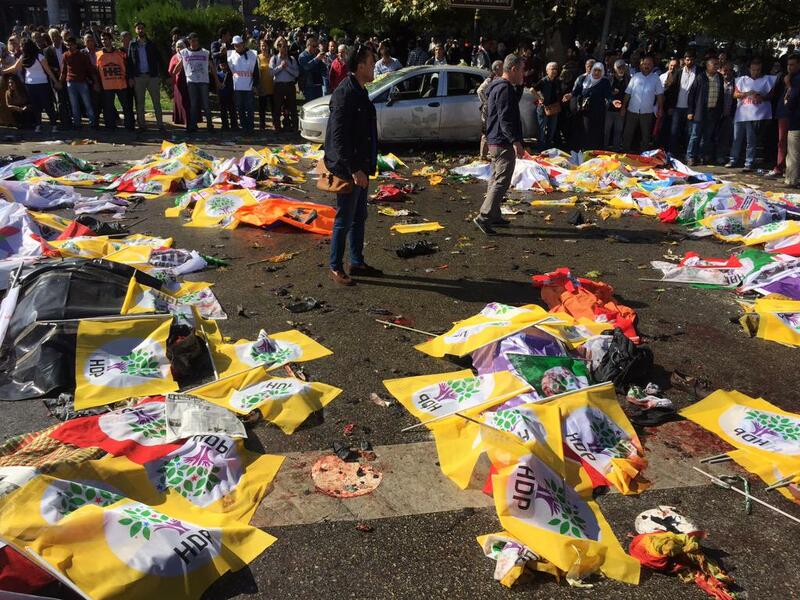 Erdoğan's electioneering: aftermath of October 10 bombing in Ankara. In Turkey's November 1 election, Recep Tayyip Erdoğan's Justice and Development Party (AKP) increased its votes from 41% to 49% in the five months (143 days) from the election in June. The AKP won a majority of seats — 317 out of 550. The governing party gained 5 million extra votes. It adopted very risky policies to get this result, but was determined to win the elections — no matter how many lives were lost. The People's Democratic Party (HDP), the Kurdish-led group that has united broad sections of Turkey's left, scored a huge breakthrough in the June 7 elections. Needing at least 10% to enter parliament, the HDP scored more than 13% and 80 seats – in the process denying the AKP, which had ruled for 12 years, a majority. As a result, no party was able to form government, leading to the November 1 rematch. The difference between the June and November elections was the degree of terror targeting the left and Kurdish community. In the July 20 Suruç and October 10 Ankara massacres alone, 136 people were killed. All up, between the two elections, about 700 people were killed — both soldiers and civilians. The government escalated its war on the Kurds to bid to push the HDP back under the 10% electoral threshold. The HDP was the only electoral force standing in the way of the AKP winning a super-majority (330 out of 550 seats) that would enable it to change the constitution to allow Erdoğan's to become a US-style president. In just three days in September, there were 190 reported attacks on the HDP and other left groups. This included the torching of the HDP headquarters in Ankara, the perpetrators of which have since been released. There were curfews imposed on Kurdish towns. More than 500 HDP officials were arrested. After the Ankara massacre, in which 102 people were killed during a peace rally, the HDP cancelled all its election rallies. In the major Kurdish city of Wan, Prime Minister Ahmet Davutoğlu threatened, just days before the vote, that if his government was not elected, white Renault Taurus cars — the infamous unmarked cars used by plain clothed police and paramilitary killers — would reappear in the city's streets. With the constant attacks by fascist mobs, military and police operations in Turkey's Kurdish provinces and media blackouts, the HDP did not have much chance to explain itself — even to Kurds, let alone the wider community. The AKP also had a very useful ally. The racist National Acton Party (MHP) posed as an “opposition” party, but in fact furiously supported the governments' war against the HDP. But the MHP's covert support for the AKP cost it dearly. Many nationalist voters shifted to the AKP. The MHP's vote dived. It lost 4 million votes to the AKP and half of its seats. Just as in the June election, the HDP was again the most important element of the November election. A crucial question was whether the HDP would hold the 13% and 80 MPs it won in June. Would its so-called “borrowed votes” — from social democrats — go back to where they came from? Would the HDP again pass the 10% threshold? In the end, the HDP won 10.4% and 59 seats. That amounts to a 15% drop — about 1 million voters. Aside from the state-sponsored terror, there has been controversy about other possible reasons for its lower vote. There are claims that one factor was the Kurdish Workers Party's response to the AKP's declaration of war. The PKK launched an armed struggle for Kurdish liberation against the Turkish state in 1984, but has recently been in peace talks with the government while maintaining a ceasefire. When Erdoğan called off peace talks and restarted the war on the Kurds, the PKK responded by going on the offensive. It carried out fierce raids on military and police posts and declared “self-determination” in several towns and suburbs in Kurdish provinces and cities where it is dominant. Kurdish youth set up barricades to stop military vehicles. A number of people, including children, were killed in these clashes. There are criticisms that the PKK's actions undermined the HDP's call for peace — and even won votes for the AKP from some middle-class and conservative sections of the Kurdish population who feared that those barricades might soon move into their suburbs. Even before the PKK insurgency began in the 1980s, the Turkish left had a long history of armed struggle. The line between armed struggle in support of the mass movement and armed struggle for its own sake has often been blurred. Kurds have every right to defend themselves. But the PKK has faced criticisms that attacking Turkish forces and erecting the barricades in suburbs and towns did not help the HDP or the Kurdish cause. Senior PKK leader Murat Karayılan, in an interview in September in the Qandil Mountains in Iraq, disputed claims that escalated attacks by the PKK favoured the AKP. He said PKK forces were only defending themselves. But many think it went beyond just defence. The loss of 1 million votes and 19 MPs has not demoralised the HDP and the left. The huge decrease in votes for the nationalist MHP has made the HDP the third biggest party in the Turkish Parliament. In the pre-HDP era, the “Kurdish vote” was just 6-7%. The June and November election results have demonstrated that the HDP is here to stay, having secured more than 10% twice in a row. The AKP government can't believe their luck. Their risky strategy paid off and isolated the HDP, in comparison with the situation in June. They will continue to attack Kurds, other progressive forces and any opposition, at least in the short term. The HDP and the left are already looking to create a renewed platform to continue the struggle against the country's Islamist tyrants.